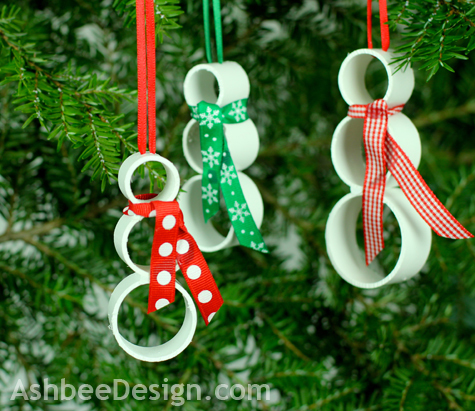 Each year I make Christmas ornaments and one of the ways I keep the ideas fresh is to look for a different material to use. Last year I did an ornament series using window screen material. This year I settled on PVC piping. Check out these simple, contemporary snowmen. The idea started this past summer when I purchased PCV pipe in four sizes for another organizational project. I had them lined up in the back of the truck and per chance they were in size order. I looked at the end and said, "Snowman!" At that point I knew I'd be exploring PVC as the material for Christmas ornaments this year. The four lengths of PVC stayed untouched in the shed (I never did get to the other planned project) so I had plenty of material to work with. I decided to keep the design simple. I thought about adding a face, a top hat or mittens. In the end I just liked the clean, simple lines of the three circles with the added scarf. 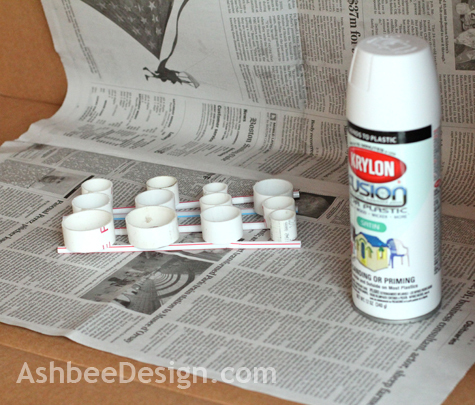 This project is quick, easy and inexpensive. Give it a try. PVC pipe in 3 diameters. 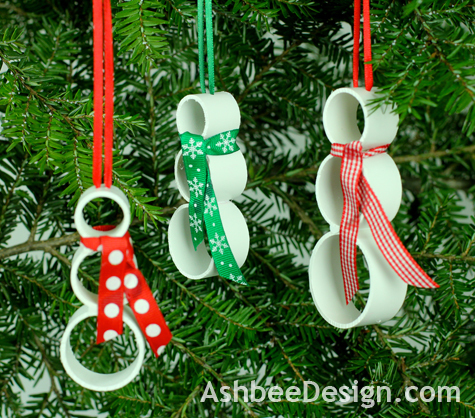 I used the thin walled PVC for this ornament. I made two different sizes. The larger one uses a circle of 1.5", 1.25" and 1" diameter PVC. The smaller one uses 1.25", 1", and .75". 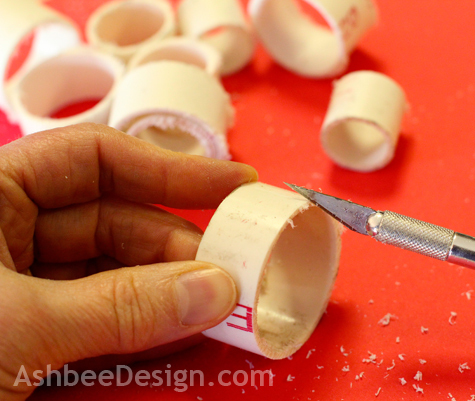 Cut the PVC pipe into 3/4" long slices. Cut one of each size for each snowman. I used a band saw because I have one but it could have been done easily by hand. PVC is easy to saw through. Sand off the rough edges. I used an xacto- blade to scrape off the plastic fuzz and smooth the edges. 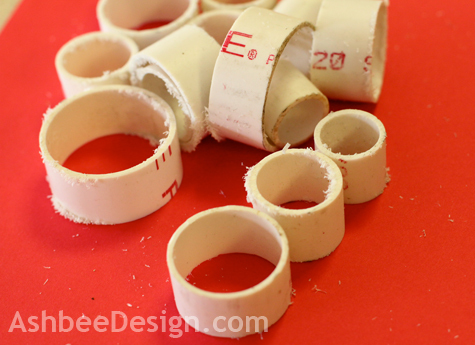 Glue the three PVC rings together. 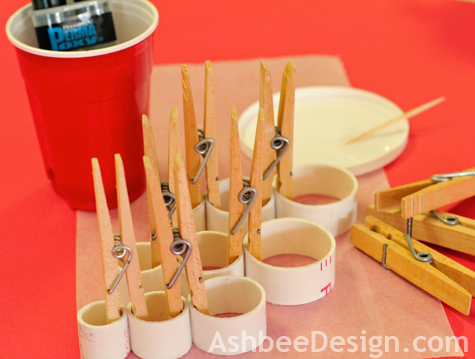 I found clothes pins to work well as a mini-clamp. Spray paint the PVC to cover the various printings on the pipe. Drill two 5/64" holes side by side in the head. Using a dental floss threader, thread 1/8" ribbon through to make a hanging loop. Knot at top. 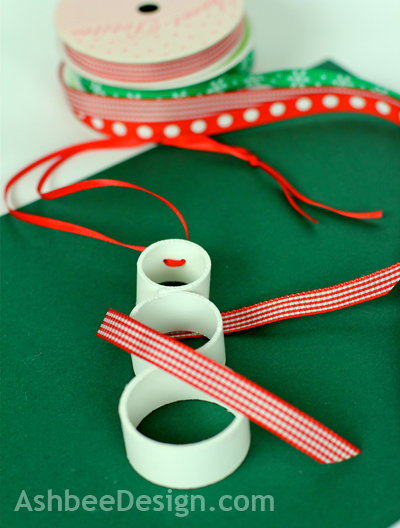 Use the 3/8" ribbon to fashion a scarf around Frosty's neck. I used a touch of glue to hold it in place. 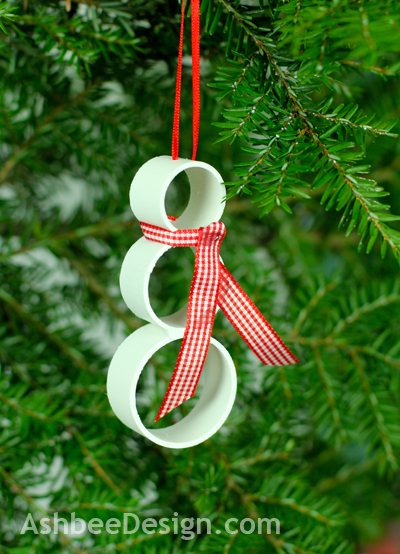 Sweet, simple and looks great on the tree. Now I need to make about 15 as gift sets. Glad I inspired you. See what other ideas yo come up with once you have the pipe. Send pictures! 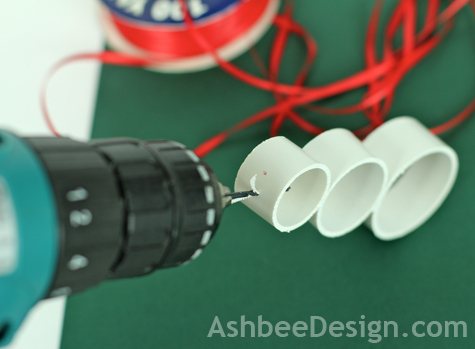 Wow, it's amazing to make something so cute out of a plastic pipe! Very clever and adorable! I find PVC pipe a must have supply. I often find ideas that make use of it. Keep some on hand! You never know when an idea will pop into your head. couldn't be cuter! love it! Super Cute! My kids would love to get some extra pvc from grandpa's house to make these! Thanks for sharing! I'm now blogging at http://something2offer.com sharing homeschool, frugal ideas, reviews, and giveaways! You are so creative! Who would have thought to use PVC pipe in Christmas decorating. Cool! Stop the madness. These have to be the cutest things ever. Great idea! Good Morning everyone and thanks for all the positive comments. I was really pleased with how these came out and how easy they are to make. I just made a second batch and I used the All purpose cement for PVC. It worked much easier than the epoxy although you do have to work in a well ventilated area. Thanks Michelle, Go visit her blog folks! Those are so much fun and so cute, love them! This must be the smartest snowman ornaments I've ever seen! So clever!! Looking forward to unpacking them and putting them on this year's tree. We don't put it up until just before the holiday. I am allergic to the pine but love a real tree! Omg! So easy so cute! I just make these snowmen, and I love them!